Six voices, but just one larger-than-life attitude! The "man with the action packed expense account" is back in action in 26 thrilling episodes. 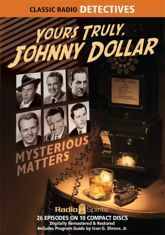 Charles Russell, Edmund O'Brien, John Lund, Bob Readick, Mandel Kramer, and of course Bob Bailey star as America's Fabulous Freelance Insurance Investigator.